Put-in-Bay Township, OH—February 16, 2015— The Perry Group, a volunteer, nonprofit organization will be celebrating with representatives from Ohio, Indiana and Michigan the historic date of February 16, 1815, when Congress ratified the Treaty of Ghent ending the War of 1812. 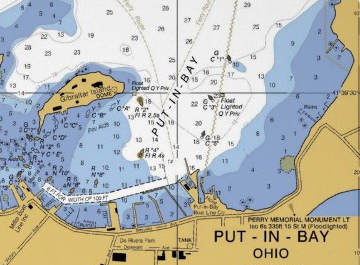 A dedication ceremony will take place on Memorial Day at Put-in-Bay, Ohio, honoring the 557 sailors who served during the Battle of Lake Erie, a turning point during the war. The Treaty of Ghent ended hostilities between Great Britain and the United States and restored boundaries to what they were before the outbreak of war. Territory, now compromising three states was carved out by the British as “Indian States.” Indian tribes fought on the side of the British during the war of 1812. Indiana and Michigan may never have become states, and the continued westward expansion of America would have been seriously jeopardized without the ratification of the Treaty. Perry’s battle flag with the iconic words “Don’t Give Up the Ship” is now on display at the U.S. Naval Academy in Annapolis, Maryland. “DGUTHS” is known throughout the U.S. Navy and is a central command for all midshipmen. Memorial Day ceremonies honoring the 557 Navy sailors who served during the Battle of Lake Erie and a celebration of the end of the War of 1812 will take place at Put-in-Bay, Ohio. According to David Zavango, chairman of the Perry Group’s Battle of Lake Erie Bicentennial celebration, “February 16 is one of the most important days in Ohio’s long and storied history. Memorial Day will bring together thousands to honor those who served gallantly in the Battle of Lake Erie. About the Treaty of Ghent. The initial terms of the treaty were written in 10 days, but it wasn’t until December 24, 1814 that both sides agreed to the terms and even longer, due to poor telecommunications, to officially announce to all parties involved that the war was over. The war of 1812 officially ended on February 16, 1815, after nearly six months of peace negotiations in the city of Ghent, which is now Belgium. Perry’s Victory and International Peace Memorial (IPM) is located within the Village of Put-in-Bay, OH. Put-in-Bay is on South Bass Island. IPM was established to honor those who fought in the Battle of Lake Erie, during the War of 1812, and to celebrate the long-lasting peace between Britain, Canada and the U.S. The Memorial, a Doric column, rising 352 feet over Lake Erie is situated 5 miles from the longest undefended border in the world. The Friends of Perry’s Victory and International Peace Memorial, also known as The Perry Group, is a volunteer, nonprofit organization working with the National Park Service and the local, national, and international community to commemorate the Battle of Lake Erie and celebrate the long-lasting peace between Britain, Canada and the United States. Since 1989, The Perry Group has supported Perry’s Victory and International Peace Memorial in its educational, historic and peacekeeping goals through the promotion and sponsorship of the Memorial’s programs and special events.